Eastern Woods Research is Back and Building Big Time!!! Discussion in 'Cross Country, All Mountain & Trail Riding' started by MMcG, Jan 8, 2008. Some of you may already be tuned into the buzz, but I figured I'd dedicate a thread here in the 29er forum to celebrate the return of Eastern Woods Research (EWR) bikes!!! Yep they are back at it and they are doing 26ers, 29ers and methinks even 650b frames!! There is a pic of a prototype up on their website right now. Have a look see! I like what I'm seein! What do you guys think about this re-birth? I think it is big time exciting. The new style of frame looks awesome, definitely an attractive update from the original frames. Aesthetically pleasing and all that good stuff. Over the years I've heard tons of good things about these bikes, but I've never been able to track one down to test ride. I'm a west coast rider, but I'd love to get on one of these new bikes and see how they handle out here. Any old EWR riders on here? ito - you might want to check the other thread I started a few months ago in the Lounge - perhaps you can track down an old rider via that thread. A local female rider here in CT has one of the more XC oriented EWR frames - I saw it a few years ago and was struck by it the first time I saw it. Well built and well suited for the east coast. I'm sure it'd do a mighty fine job out west too. Oh dammit, you had to post that, didn't you! I've always regretted not getting one when they were originally available, so I'm going to do my best to get one this time. I sure wish bikes were cheaper. sidenote: good to see Jay de Jesus back. Didn't he have some kind of horrific crash a year or 2 ago? slowride - I don't think the idea behind these is for them to be super duper expensive. So perhaps one will fall within your budget without too much trouble. I plan on keeping up with updates to that web site myself. You may have to sell a Balfa or two! Yep-right here. Not "old" though..
Those bikes are great and made well in the U.S. I wish Jay would get into the e-chat room buzz, but he's too busy riding, building frames and enjoying life. i've read and re-read your mtbr post...that bike is flat out awesome. nice job! MMcG tipped me off to this while I was at work wrenchin' today. This is great. I always have been curious about how these rode ever since seeing the ads back in early Dirt Rags. Jay is a very smart saavy mountain biker and his old scribin's in the Rag were really good. 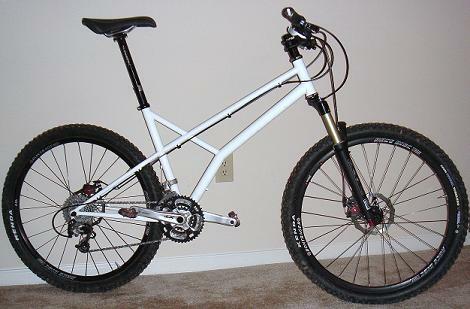 And of course, a 29"er EWR would be so cool I think I'd die and go to heaven if I could ride one of those. Thanks Mark for pointing this out to me. I've gathered that from many of the responses. Thank you. You'll dig what i've got in store in a bit then.. I'm looking to upgrade from my Karate Monkey (maybe, I am very reluctant to even think of riding something else) this year. If an EWR works out a reasonably priced 29er SS with a rigid fork I might have to spring for it. I'm hoping to control myself though and just get a new set of wheels and maybe some nicer parts for the KM. Choosing bikes is almost as tough as choosing women right now. It's in the top post. Looks like a 29er is still up in the air a bit for right now. But perhaps a 69er will come first? Way to chime in there Mr. Negativity. I hafta agree with N8. ATMO, 96'ers are um...fugly. To put it mildly. Like I posted after your Soul 9B, it looks much better that way. If EWR were to do a 29/650b set up, to keep the rear short, I may actually be interested in that. But 29/26? no way. They may function fine - but god are they ugly. Too imbalanced front to rear. The 9/b mix is more pleasing to the eye. If Jay is concerned about keeping the stays short, I think he should design the full 9 bike specifically to be run as SS or 1xn. That'll solve front derailluer issues right there. Redline does it. Salsa does it. I do it. I never remember but what does ATMO stand for again? According to my opinion is it? Now that I've ridden a few 69ers and the Bumblebee - I do have to say I prefer the ride feel of the 29/650b combo over the 69er combination. And yeah - it also looks better. For example - this looks pretty dorky eh? Or even better yet - this! Stay tuned for a Test Report Thread on this little Bumblebee shortly! Note - the Carver is a Prototype with 17.5" chainstays. You could easily get to under 17 I think with the right design and still have room for a front derailleur methinks. The Titan up above features 17" stays and there is ample room between tire and bb/st junction - where it gets tight is in between the chainstays as the stays were " crimped" for 26" wheels/tires. Jay, Don and I put the numbers all together and decided to do a straight up 29'r. So no need to worry about the 69'r or 9/b looks. We'll have the updates on the web this week. We have T-shirts available for sale. Check out the store. I take it you figured out a good way to get the shortest 29er chainstays you could on an EWR 29er - can't wait to hear about the details. Please make an XL in the 29er. You guys should email EWR directly - they'd appreciate knowing what folks what I suspect. Maybe if enough XL riders step up they may do a run? i sent them an email so we shall see... a purple ewr 29er would the be awesome. Who has one of the new ones and can I see some pics.? Hooples has a new OWB 29er! Yeah I saw his post in the lounge but was hoping to see some more info. I am thinking about getting the 26 version. Why not email or call the guys at EWR. Kenn and Jay are great and I'm sure they can help answer any questions you might have. I hate calling builders when I am at least a month from buying, talking like a high school kid wanting to purchase something I can't yet. Don from EWR Bikes here. Shoot me, Kenn or Jay an email and let us know what you're looking for (i.e. frame, frame and build kit, etc.). A month out isn't too far to begin a conversation with us about frames (especially if you want a custom color). loved EWR back in the day... if I was in the market for a hardtail, I'd defn give them a look again. Your current hardtail ain't too shabby either dump! Hey folks, I just got this month's Dirt Rag in the mail to find a full product review on the EWR OWB29er. It has some very good detailed pics too. Thought you might be interested in checking it out.